Is that it might not be for you. For the full experience, I’d highly encourage you to hit play on the audio below and then start scrolling. All music composed and performed by Yours Truly. Earlier this week, I witnessed a bad situation. It seems this guy was having a bad week. After a personal health emergency, he desperately needed money to support his family. He had a 3-year old blog–and turned to his blogging Facebook group cohorts in desperation. He stated his traffic was still really low, he doesn’t have a lot of time to blog, and he needs money. His blogging cohorts encouraged him to double-down. They told him he wasn’t doing the right thing. They told him to dig in. Did that advice help this person in the short term? Chances are high you won’t have a million-dollar online business. And maybe blogging is not for you. And maybe you should stop telling other people it’s for them. And maybe digital marketing influencers like me should do a better job preparing you for this truth. And maybe we do a terrible job a setting proper expectations–because success is insanely effective marketing. For years–Pat Flynn has been releasing his online business income reports. In fact, it was seeing him earn over $100,000 in a single month is what go me into online business. They were inspiring and probably great marketing. Just this week, Pat released a YouTube video sharing WHY he decided to stop releasing income reports. Why shut down such an authority-building marketing tool? Pat felt his income reports no longer resonated with his audience–and may have even turned people away from his brand. So he stopped–and I’ve never been prouder to say I’m a Pat Flynn fan. Kudos Pat. I still aspire to be like you. Every time I release a personal success story, win, or dazzling income report, the same thing happens. The more “look how amazing I am” rhetoric and language I use, the more I seem to make people think I’m actually amazing. And bloggers buy products from other bloggers they think are amazing. The more “look how easy this can be” rhetoric and language I use, the more opt-ins I see. …and hyping myself up for the sake of authority. I hereby admit I have crossed that line before. The truth is, I do need Blogger U sales in order to feed my family. In order to continue to do this for a living. That’s an incredibly stressful life at times, and one I sincerely don’t wish on anybody. Keep in mind that I’m well aware this will turn some bloggers off of the DYEB brand. However, if there’s a small chance this will turn some of you into “true” fans, then I’m willing to take the risk. …growing a blog into something “successful” is really, really hard. …it can be absurdly stressful for such a seemingly “fun and easy” hobby or passion project. …it never gets easier. At least not in the way you want it to. The truth is…no single influencer is to blame for over-hyping your chance at success. This is a broad issue across online business. …bloggers often feel shame when they lose motivation, fall behind on their posting and simply want/need a break. …we do. And that can destroy our progress, as well as our ability to change the lives of our readers. …that “step-by-step” formula might not bring you any results. …Blogger U might not be worth your hard-earned cash. Especially if I’ve sold you without proper expectations. …I’m afraid this message will still fail to get in front of the proper people who enter the online business space, at the time when they need it most. The truth is...you can build something that matters. You can make money blogging. You can. You can grow an audience, and get heart-warming emails, and become influential. You can get speaking gigs, and social media shares, and organic email list growth. You can launch courses and build side hustles–and yes, you can even quit your day job. But not for nothing in return. Allow me to set proper expectations right now–regardless of where you’re at on your journey. It’s going to take grit, sacrificing time with family or loved ones. It’s going to take willpower to sit down and do the work when you’ve been away for a while and don’t even know where to start. It’s going to take a little luck. It’s going to take a passion for what you’re doing–and a constant reminder of why you’re doing it and the people you’re doing it for. 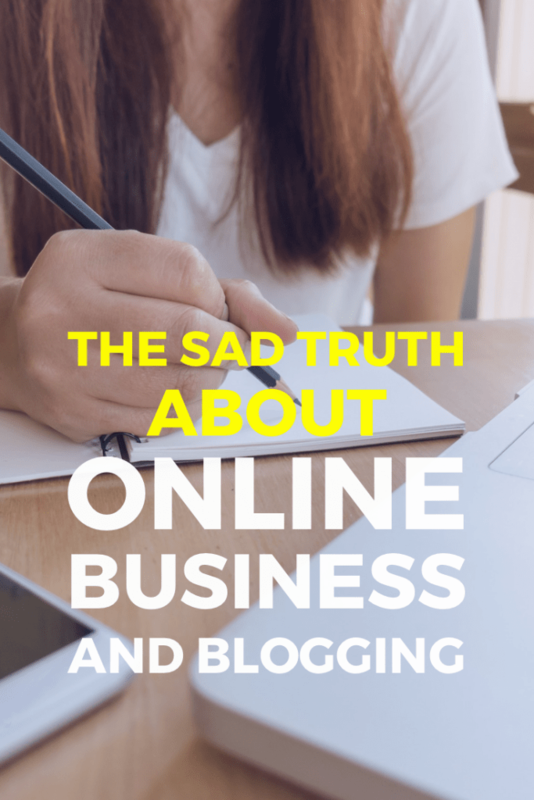 Maybe online business and blogging truly isn’t a good fit for you. My sincere desire is that you find the guts necessary to stand up and figure it out for yourself. I pray you understand the crazy obstacles you’re almost certainly going to encounter–and I hope you have the support in place to crash through the other side. I hope you’re up for it. First, If any of this resonated with you, or if you’ve been bruised by improper expectations before, know that you’re not alone. The desire to do great things and make a ton of money is completely natural, and being driven to success is human. That’s still a good thing, even if it does result in stress and occasional heartbreak. Second, you should join my tribe. Not because I’m a millionaire blogger, or because I have all the answers, or because Blogger U might be a chance to level up your blog. You should join my tribe because you’d fit in. I will attempt to teach you things based on my own experiences. I will sell you things. But I’ll also speak the truth when the truth is what’s needed. DYEB is your community, too. Not just mine. You can start by joining our private Facebook group, or by joining the newsletter below. Furthermore, feel free to share if it’s that important to you. I sincerely appreciate you.